Carlingford County Louth and The Cooley Peninsula are situated in the north east corner of county Louth, midway between Belfast and Dublin. 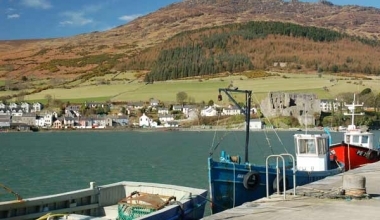 The area as a whole and Carlingford in particular has a rich historical heritage primarily because of the Tain Bo Culainge or the Cattle Raid of Cooley, an ancient Irish saga. The Cooley Peninsula is roughly divided along a north westerly/south easterly line with fine fertile soil to the south west and rugged mountain terrain to the north east, the Cooley Mountains (highest point Sleive Foy , 588metres) are ideal for walkers and hikers of all experience levels and form,and with Carlingford Lough dramatic views from wherever you are in the peninsula. Carlingford County Louth and Cooley also has a number of important pre-historic and medieval sites, especially within the confines of Carlingford itself. 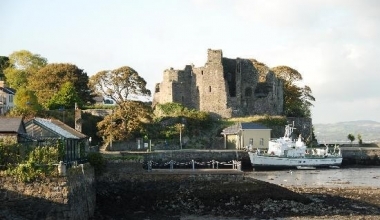 For instance, the village itself is dominated by the remains of King Johns Castle, the first major construction in Carlingford’s history built in the twelfth century. Other fine examples of religious and secular buildings dating from the twelfth century onwards can also be seen in the village. Carlingford has a deserved reputation for hospitality, with some of the finest restaurants and friendliest pubs in Ireland, it also offers a wonderful array of finest quality accommodation from hostels to hotels and a multitude of different things to do. Local adventure centres offer you rock climbing, abseiling canoeing, kayaking, sailing and windsurfing in the waters of Carlingford Lough and the Irish Sea. If its golf you want, there are ten golf courses, parkland and links in the region. The area has been awarded the prestigious “European Destination of Excellence” an imprimatur to the visitor of quality and a real cultural experience.